First of all, let’s see which parts of the world feature the most users. Contrary to general belief, it is not North America! With more than 1 billion users, Asia definitely takes the lead, followed by Europe with approximately 600 million users, in comparison to 350 million in North America (North America being defined as the U.S., Canada, and Mexico). In many cases, it is not a matter of buying power, but rather mail order habits based on the country’s postal delivery system. In fact, in many countries where the postal system is unreliable (not to say flaky! ), online users were not “groomed” with mail order habits prior to the internet. As a result, although such markets will look for products and services online, they certainly are not as mail order oriented as other countries featuring more efficient mailing systems. Therefore, it is impossible to rely solely on the amount of users when considering establishing a multilingual presence online. Another good example to illustrate such fact would be China and Japan. China currently has almost 642 million users and it is one of the fastest growing markets on the internet. Japan, with 109 million users, has nearly reached its maximum potential with almost 86% of its population online. On the other hand, one needs to consider the worth of Third World markets/less economically developed countries. For instance, countries like Bangladesh, Mozambique, Somalia, etc., might not seem very attractive at first. However, in Third World markets, those online are affluent and wealthy. In those countries, there is no middle class. Basically, you are either dirt poor or filthy rich!. Many online gambling portals and entertainment websites of all kinds have found high spenders in economically-disadvantaged-markets. In fact, wealthy individuals in Rwanda or Chad do not have many entertainment outlets in their homeland! Furthermore, most everything is lacking within their country infrastructure: clothing, electronics, etc. Online applications have therefore become a form of “entertainment salvation” for the wealthy minorities of third world markets. I advise you to perform a meticulous evaluation of your market potential when developing a presence on multilingual search engines. 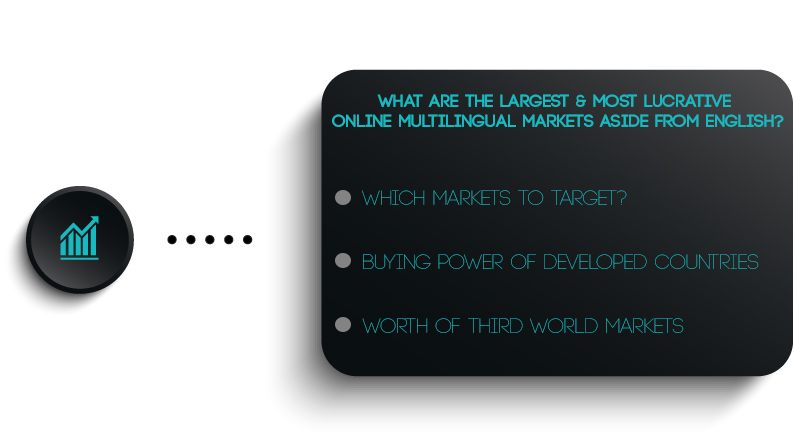 So many factors need to be taken into consideration…Do not look at Japanese, French or Spanish just as country specific, but rather online language market shares! Just as an example, aside from all countries where Spanish is spoken, one of the most active Hispanic online markets is in the U.S.!